*UPDATE* Now available at Amazon! This book was published to accompany an exhibition of the same name at the Church History Museum in Salt Lake City. Therefore, distribution of the book has been limited. Copies are available at the museum gift store, at store.lds.org, and at some independent bookstores in Utah. 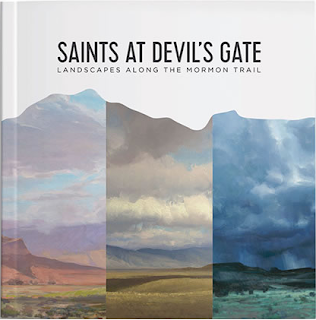 A beautiful art book from the Church Historian's Press, publisher of The Joseph Smith Papers. I loved this art book, not just because of the gorgeous paintings, but also the history and real accounts from trail journals and reminiscences of pioneers. Their words truly enhanced the viewing experience and I'm sure the exhibit in the Church History Museum is amazing! The paintings allowed me to try and see the landscapes from the pioneers' perspective, and the wide range of experiences shared showed the trials and joys of men, women, and children of all ages. I was surprised to recognize one of the modern scenes- the road leading to the Winter Quarters Temple. I've driven on that road a few times while in Nebraska for family events. The pioneer cemetery next to the temple site is unforgettable, especially when visited during an icy winter since it brings to life the harsh conditions they endured. I liked that the book showcased the work of three artists, providing both variety and continuity. There are sidebars of information on the majority of pages that provide historical context for the painting subject and pioneer accounts that provided enlightenment. The size of the book is large but not overly so, it fit inside my church tote. The pages are high quality paper and will withstand multiple viewings over time. It is a well-produced book of beautiful art and I encourage you to visit the exhibit and/or purchase a copy for yourself!